Whilst every trip that I have embarked upon has had its own unique character and challenges, they have all had their similarities too, so much so that I just simply accept their existence. So, when beginning to think about the practicalities of the forthcoming trip to the Danakil Depression, it was a bit of a surprise to be hit by a rather obvious fact: There’ll be no electricity. Now really, this should be of no surprise whatsoever as we will be, quite literally, in one of the most desolate and inhospitable places on the face of the planet but still, up until this trip it is not a problem I have had to face before. Now to call this a problem may seem a little melodramatic – Mankind had lived quite happily without electricity for millennia and so I’m sure I can cope for a mere two weeks. It’ll even be fun. No, Man does not need electricity to survive. But camera batteries do. A few years ago I was up in the Andes on a four-day trip between San Pedro de Atacama in northern Chile and Uyuni in Southern Bolivia. We travelled in jeeps, slept in refuges and ate fried spam for dinner. In many ways it was the forerunner to the Ethiopia trip; a barren wilderness unscathed by humans. And no electricity. I managed to survive on the five camera batteries I had, but did run most of them down. That was four days without being ‘connected’. Now I have two camera bodies, invariably forget to turn off battery-sucking image stablisation and am shooting more video – and 13 days of power to provide. To make matters worse, I’ll be taking my trusty 13” MacBook Air with me which serves the dual purpose raw file backup and Adobe Lightroom viewer. I did spend a while thinking that I could just do without the laptop – a luxury after all – but I have increasingly found the ability to look at images on a big screen at the end of each day invaluable. After all, I’ll not be going back and so I want to make sure that those killer shots on the camera’s LCD display are equally killer when viewed at a more normal size. And just like the camera batteries, the Air is not solar powered. I know basically how solar charging works but I also know that the theory does not always translate into a practical solution, or at least an affordable and portable practical solution. And Google was throwing many, many options my way. In the end I found the interesting web site of Voltaic Systems a company based in the USA who stood out for two reasons. First, they offered a complete charging kit; the panel, the lithium ion battery and all the cables and adapters. Second, they offered the right cables and adapters. They had a charging adapter suitable for my Canon 5D2 and 7D cameras batteries and they had an adapter cable for my 2011 model MacBookAir. In short they were a one-stop shop for exactly what I was after. A few emails were exchanged over the weekend and later that week a package turned up on my desk, followed a few days later by a smaller one containing some adapters to allow the solar panel to be strapped to a backpack. And so I was sorted. If it works, that is. 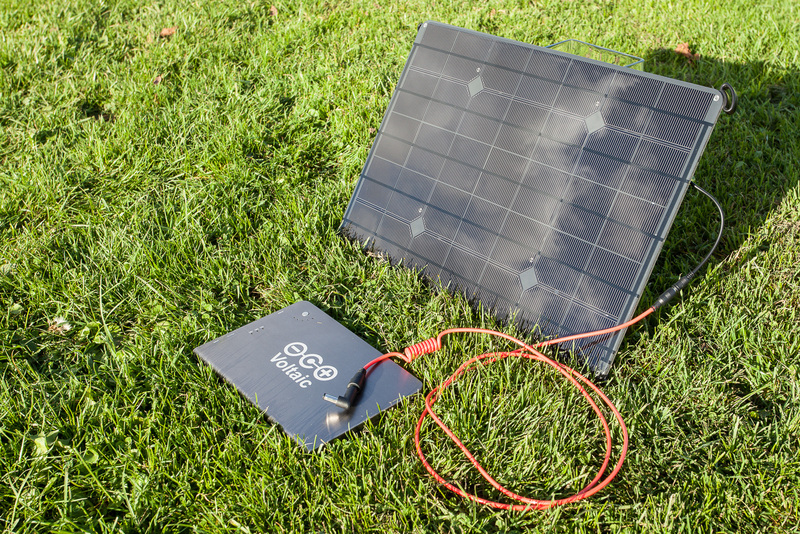 The kit looks to be essentially very straightforward to use: You use the panel to charge the 20,000mAh lithium polymer battery and then use the battery to charge the laptop or camera batteries. You can charge the batteries directly from the solar panel, but Voltaic Systems strongly advise against connecting a laptop direct, presumably due to voltage regulation issues. The V72 battery in the kit is estimated to provide a MacBook Air with a single full charge. So, at the end of the day I could be charging the Air whilst charging a battery. For my Canon LP-E6 batteries, the estimate is six hours charge time. Initial tests were, frankly, disappointing. I spent a few hours in my study with the panel facing the window and eagerly watched the provided battery show signs of charging by the miracle of harnessing the power of nature. Except that it didn’t. Being the geek that I am, I adopted the nuclear approach and immediately reached for the voltmeter – 15.9V. It is rated as an 18V panel and so at least something was working. It was only then that I did what a normal person would have done and read the copious instructions on the website. 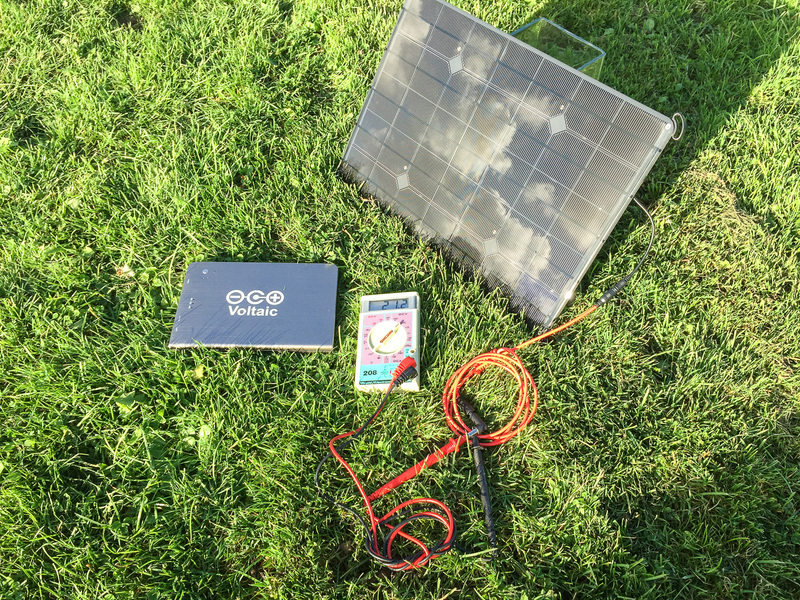 So, rule number one: Perhaps the clue is in the name – solar charging kit – but it doesn’t work very well when indoors. Even window glass will reduce the amount of light reaching the panel. Once I opened the window and gave the panel a more direct view of the sky, the voltage jumped up to a more usable 17.9V. And more importantly the indicators on the battery sprang into life. I had finally mastered nature! And then they died again. This happened several times over the next hour and no amount of cable-wiggling or repositioning of the panel helped. But the voltmeter did show the voltage coming off the panel was intermittently fluctuating and then I worked out why. So, rule number 2: Clouds passing in front of the sun can cause the voltage to drop enough to stop charging. This was all way back in August and having some time I today went out into a bright British November afternoon for more testing. So, how did it do? Whilst 21 volts may not seem like much it is worth remembering that a car battery generates 12 volts and most mobile phone and tablets require a mere 5 volts. But, does it charge the all-important V72 battery?